Cellular Blinds (also known as honeycomb blinds) are one of the most popular styles of all window coverings, the unique honeycomb structure helps to create a barrier between the room and window granting additional insulation. 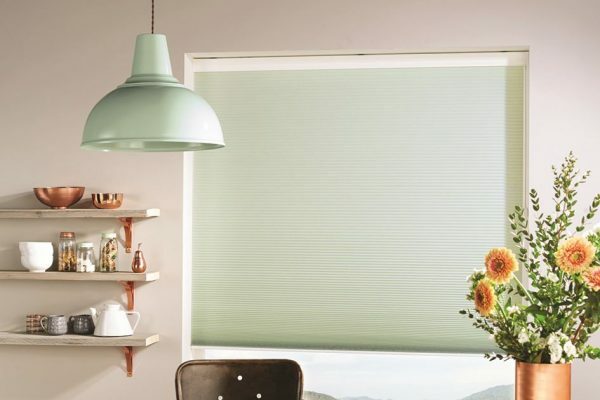 Premier Blinds can supply and fit a wide selection of vibrant and colourful cellular blinds in a range of designs from blackouts to high performance fabrics that help regulate room temperature all year round. Premier Blinds offer a fast fitting service completely free of charge. Contact us today for a free quote! Cellular blinds utilise a cordless system that is easy to use, simply lift the bottom rail of the blind and raise it to allow more light to flow into the room. To bring the blinds down, simply pull the bottom rail down towards the ground and tilt the bottom rail back and forth to maneuver the slats to the optimum position. This easy to use mechanism allows complete control over the amount of light you would like in the room. Cellular Blinds offer the versatility to be used in a wide range of different environments. Whether you need Blackout Cellular Blinds for a home cinema room / bedroom to high performance blinds for a conservatory which keep heat in during the winter and allowing a cooler environment in the summer. Cellular Blinds are a fantastic Window covering for transforming any room into a stylish living space while also maintaining a perfect level of heat. Premier Blinds is a family run business which have been installing and advising on window treatments for over 20 years. Our mission is to ensure our customers receive the best possible service and are left feeling satisfied that their blinds are the best quality and have been installed to the highest standard. Why not give us a call to discuss our complete range of cellular blinds and find the perfect blinds for your home, taste and budget.